Happy Metal Gear Solid V day! Honestly, I’ve been counting this down for ages now, and I’m tickled pink to finally have a go at Hideo Kojima’s last (for sure this time) title in this acclaimed franchise. One thing I’m not so happy about is the obvious publisher meddling that has occurred – with the multiplayer F.O.B mode requiring in-game currency to access. Currency that will cost you a hell of a lot to buy. 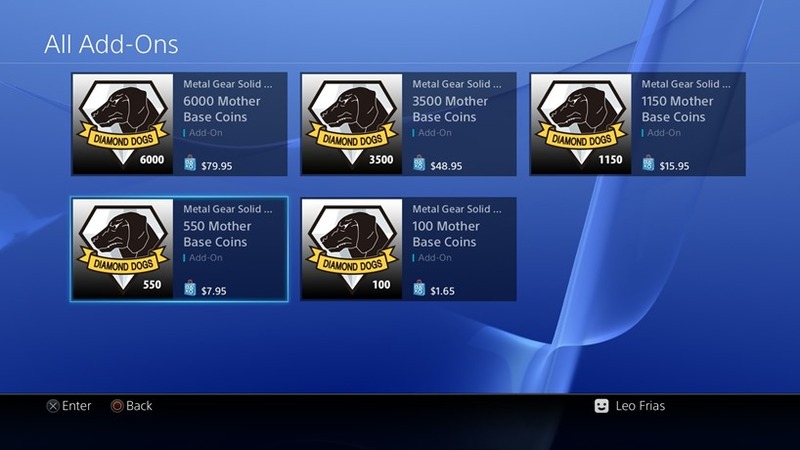 Being thrown up on PSN yesterday, we now have a little bit of a better idea as to how in-game currency in The Phantom Pain works. When the game first prompts you to engage with the F.O.B mode, you’re given your first bit of sea to construct a base on for free. That essentially unlocks multiplayer for you, but expansion of that base requires a lot more investment. More locations for purchase sit within ranges of 1000MB to 1200MB (the in-game currency), while you are able to purchase coin packs from anything as little as 100MB to 6000MB (the latter of which costs a staggering $80 in funny New Zeland money). Of course, a lot of this can be earned in-game too, but the rate at which you’re realistically able to expanded your F.O.B isn’t quite certain yet. But does this impede on the core Metal Gear Solid V experience? Our own resident cabbage, Matty, had no issues with being excluded from the mode during his review, and a 100% playthrough by Destructoid agrees with that. You aren’t missing out on anything vital to the main story if you don’t engage with the F.O.B – which is a little relieving. It is, however, still an exploitative system that has no place belonging in a full-priced game. Regardless of whether or not it takes a minute or an hour to grind enough for a new base, these types of progression mechanics have no right to exist within a product that has already forced you to pay to play. The only reason they still exist is because people are ultimately engaging with the model, so we only have to look at ourselves and wonder if we’re giving publishers a reason to force this garbage on us constantly. Want to really sink your teeth in F.O.B? So do I, but I’m not paying a penny more to do it.